With this Joomla! plugin you can increase your page speed easily. Say goodbye to render blocking pages! A page's speed is one of the many criteria that you should think of in your search engine optimization (SEO). The performance results depend on your individual setup. But have a look at our Case Study on Page Speed to see which results are possible. The case study is tested with Google's online tool PageSpeed Insights and increased performance by up to 36 points (mobile speed) and up to 27 (desktop speed) on a few real-life websites. Aimy Speed Optimization allows to optimize image loading with deferred or lazy loading. Both methods speed up the rendering of your Joomla! website. Additional options allow individual fine tuning. 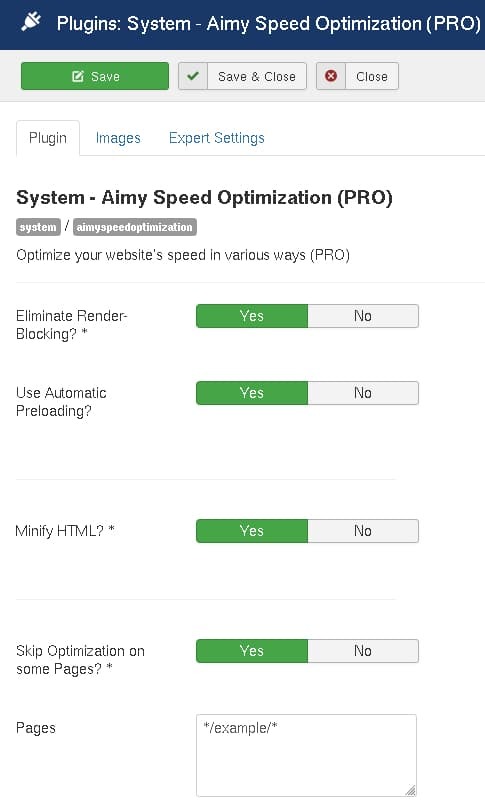 Aimy Speed Optimization implements a lot of suggestions made by Google's PageSpeed Insights online tool you will find in the following feature list. For detailed information on the technology, please have a look at the documentation. The plugin is very easy to set up. You will receive updates on new releases (per domain(s) for one year - 15 months on renewal). The way images are loaded can be optimized: You can choose to either just add missing image dimensions or load images deferred or lazy. Besides that, browser caching and compression can be activated and configured automatically (using Apache's .htaccess file). These features help to speed up your Joomla! website with a faster rendering in your visitor's browsers. With Google™ Page Speed Insights you can check your website's speed from various perspectives. We believe this is not a coincident, but a chance to tune your website for your visitors and gain some SEO benefits as well. NOTE: All plugins are disabled by Joomla! when installed for the first time. 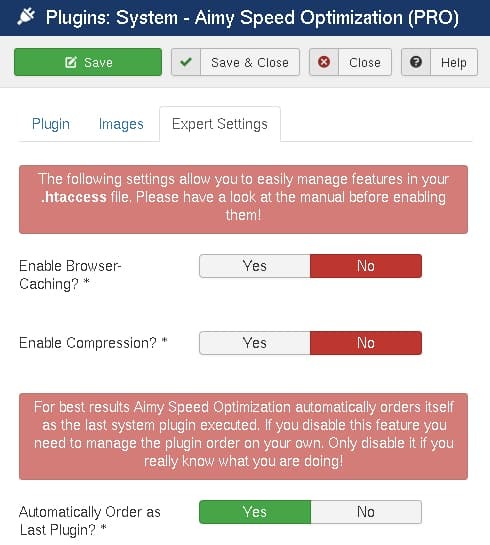 To enable Aimy Speed Optimization, proceed and configure the plugin. At any time, you can configure the plugin using Joomla! 's Plugin Manager by choosing "Extensions" → "Plugin Manager" from the menu. Locate the plugin and click on its name in the "Plugin Name" column of the plugin listing. 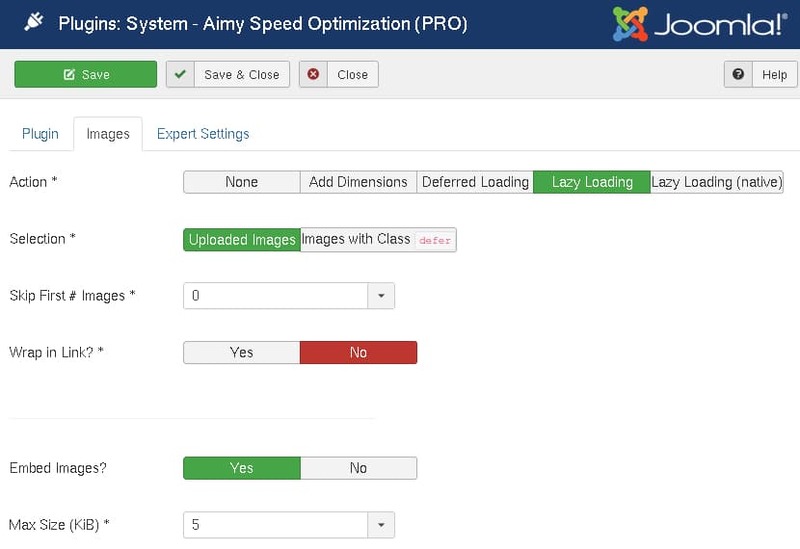 The default configuration of Aimy Speed Optimization leaves any decision how to optimize page speed on your Joomla! website up to you, that is, the default configuration does not enable any of the available optimizations. If enabled, your HTML code will be minified before being delivered to your visitor's browser. Enabling this setting is recommended only if the "Expert Settings" option of "Enable Compression" cannot be used. Aimy Speed Optimization gives you a couple of options to optimize image loading on your website (<img> elements). Both popular techniques of deferred loading and lazy loading are supported. You can either choose to manually select which images should be optimized or automatically select all uploaded images. Which action should be applied to your images? Keep images as they are. Automatically add missing image dimensions ("width" and "height" attributes). This option handles onsite images only. Replace all selected images with a transparent placeholder. To speed up rendering, missing image dimensions of the original image are added. Once the page has been initially loaded by the browser, all image placeholders will be replaced with the original images. Note: This options works for onsite and offsite images. But if the image is loaded from an external website, dimensions cannot be set automatically. In this case, we recommend to add width and height manually. The original images are then automatically loaded whenever they get near the user's view, i.e. by scrolling. We recommend to use deferred image loading as it has fewer side effects than lazy image loading and is thus more robust (see Restrictions below). Which images should be optimized? All onsite images uploaded to Joomla! 's /images/ directory, i.e. using com_media ("Content" → "Media"). Most Joomla! editors allow to add classes to images easily. We recommend to manually select images by adding the "defer" class to them. The manual selection sure takes time but in our experience leads to best results. Set whether to skip the first images of the selection given above. Both deferred loading and lazy loading make use of the well-known "data-src" attribute, which is used by Google™ itself. However, this option allows to wrap each image of the selection in an HTML link (<a> element) that points to the original image, unless it is not used within a link already. This way, you can make search engines find your images more easily. We recommend to enable this option only if you have problems with search engines not picking up your deferred or lazy loaded images. The expert settings allow you to change your .htaccess file directly from the Joomla! backend. They require that your website is served by an Apache web server and that an .htaccess file is already present in the root directory of your Joomla! installation (i.e. the one shipped with Joomla!). Please do not manually change the marker lines inserted by this plugin - they are required in order to update your configuration according to your settings. WARNING: Before enabling an expert option, be sure that your webserver is configured to allow the overrides specified along with the settings to be used. Usually these directives are available and allowed. However, if in doubt, ask your webhoster to be sure! Hint: If you could set a custom Directory Index in your .htaccess file, you can safely enable this option as well, as both require the same Apache Override to be allowed. Hint: If you are using SEF and successfully enabled mod_rewrite in Joomla! 's Global Configuration, you can safely enable this option as well, as both require the same Apache Override to be allowed. If any of these settings is changed, your .htaccess file will be updated accordingly when the configuration is saved. HINT: If the plugin is deinstalled, the lines inserted by Aimy Speed Optimization will be deleted automatically. If you had enabled the options before and then deactivate the extension the lines will still be in your .htaccess file. Please disable these options and save this setting before deactivating the plugin. Internet Explorer 8 will not interpret any media queries in embedded CSS code, even if an auxiliary library like respond.js is used. Dynamically generated and offsite CSS code cannot be embedded (i.e. CSS of an offsite webfont). Require.js resources are kept as is, because they are usually loaded asynchronously on their own and work as expected with Aimy Speed Optimization. Lazy loaded images may only be available in the print version or in Reader View if they have been loaded already, that is, if they have once been in the reader's view. Automatically wrapping all deferred or lazy loaded images in a link may break some image galleries or slideshows which make assumptions on the structure of the images and their containers on their own. Browser Caching and Compression are realized via the configuration of the .htaccess file. This will only work for Apache web servers. Alternative: set "Conservative Caching" or "Progressive Caching" in Joomla! 's "Global Configuration" ("System" → "Cache Settings"). The plugin does not work if the "Eliminate Render-Blocking" option is active. Alternative: use another captcha plugin like Aimy Captcha-Less Form Guard. The template does not work as expected if the "Eliminate Render-Blocking" option is active. developed by Matt Butcher, Matt Farina & Asmir Mustafic. developed by Netzum Sorglos Software GmbH. 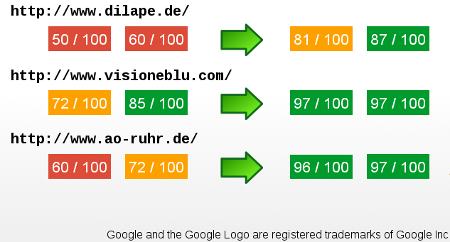 Watch the video introduction and see how easy you could improve your Google™ PageSpeed! Interested in search engine optimization for your website? Have a look at our other SEO extensions!